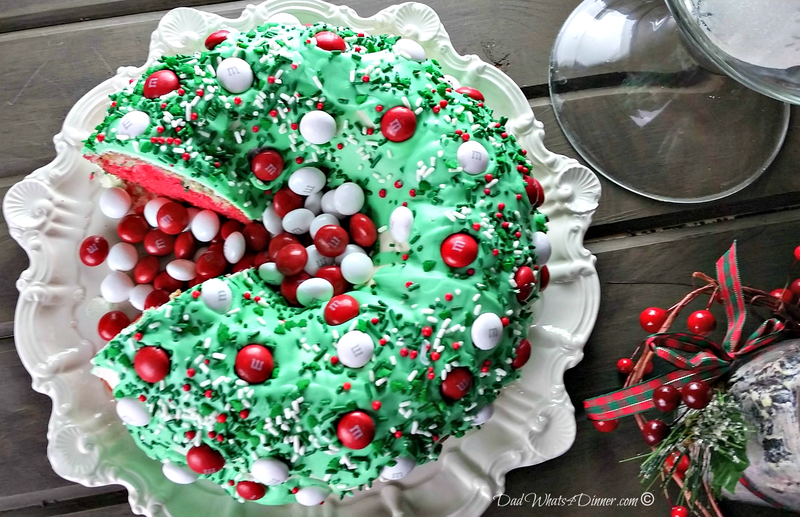 Christmas M&M’s® Bundt Cake is the perfect dessert for all of your Holiday gatherings.. Kids and adults will love this festive cake..
Every year, on the Friday after Thanksgiving, our family tradition is to pick out our Christmas tree and enjoy the day getting into the holiday spirit. We have been visiting the same tree farm since our kids were born. 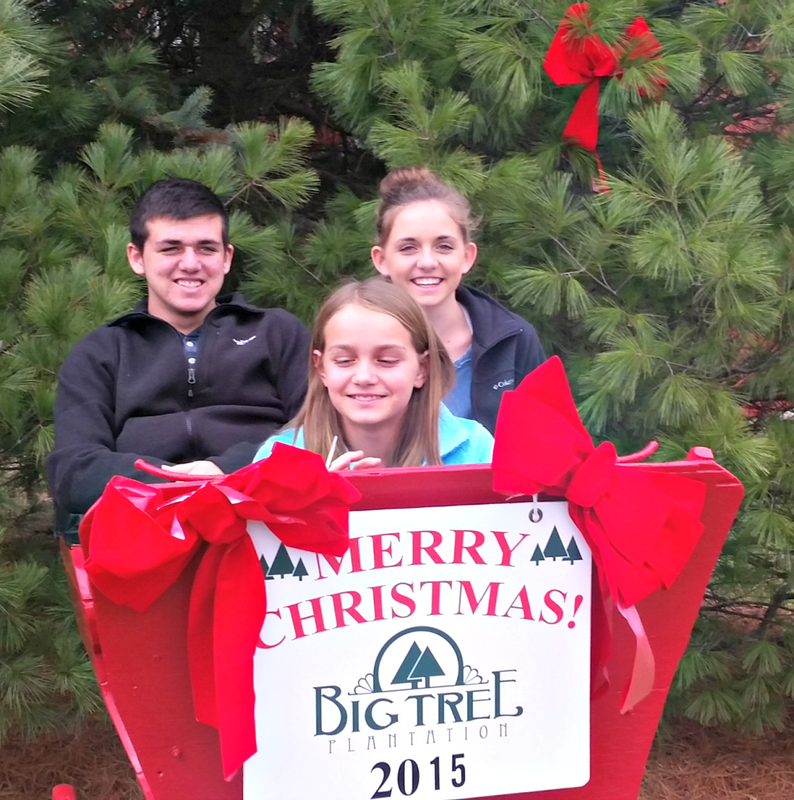 Big Tree Plantation is located in Lebanon Ohio, about 20 miles from our home. This place is great for making family memories. Not only can you cut your own tree but you can enjoy a hay ride, Santa, and free hot chocolate. They have a fabulous barn with a huge selection of ornaments and Christmas decorations. Every year we pick out a family ornament and our kids also pick out individual ornaments. There is a sleigh in front of the barn for photo opportunities and we have a picture of our kids in the sleigh from each annual visit. What a great memento! This year I decided to make a Christmas Bundt Cake for us to enjoy as we trimmed the tree. Earlier in the week, I was at Walmart picking up milk and some final ingredients for my Thanksgiving cooking. 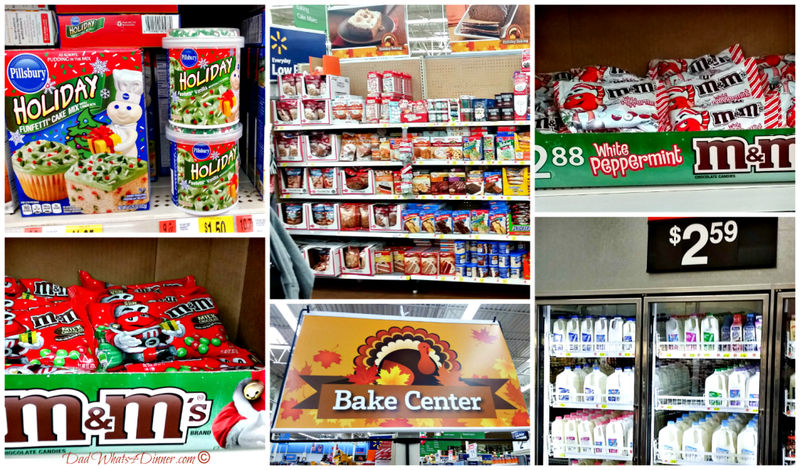 Walmart has a great display of Holiday baking supplies in a center aisle display and I noticed Pillsbury™ Funfetti® Holiday Cake Mix. 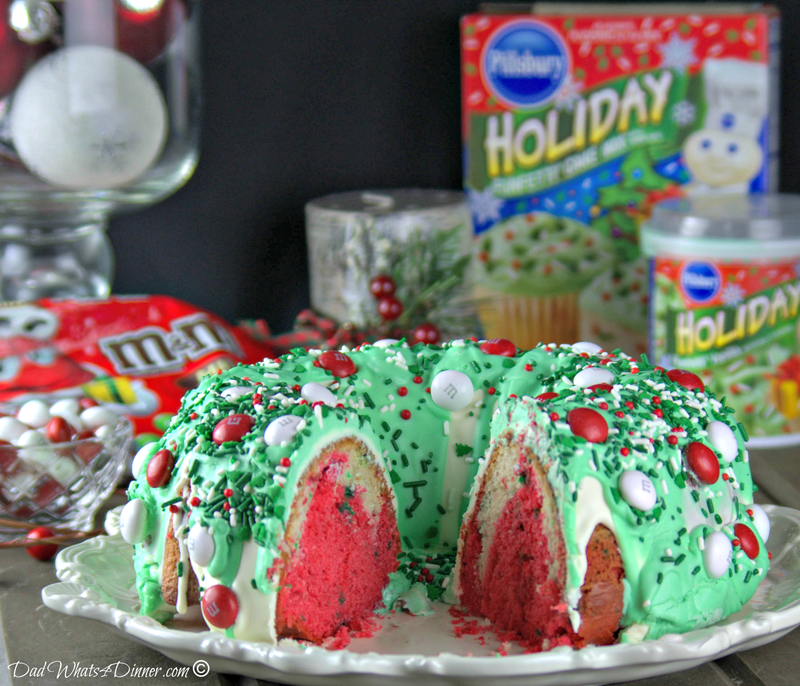 I have used Pillsbury™ Funfetti® Cake Mix in the past but have never seen the Holiday version. 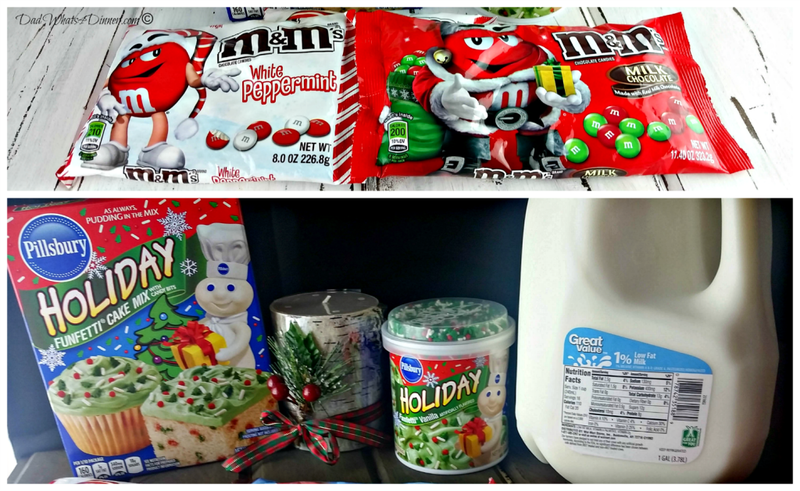 I picked up a few bags of M&M’s® White Peppermint and M&M’s® Holiday Milk Chocolate to include in my holiday bundt cake. 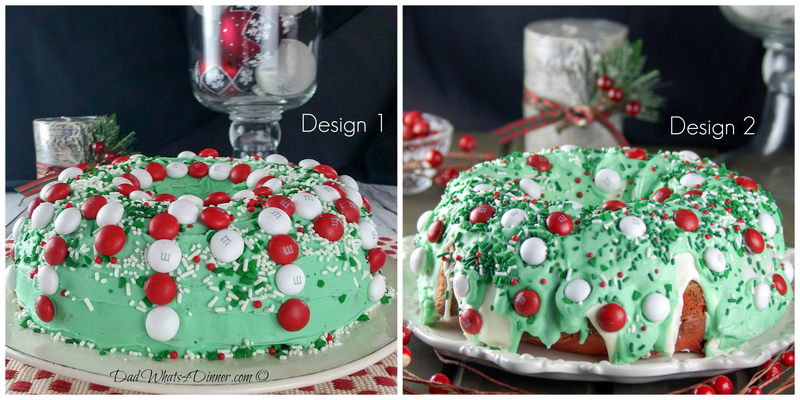 These items got my baking creativity going and that’s when I came up with the design for this Christmas M&M’s® Bundt Cake. This cake is super easy to make – so easy, I ended up baking two! The main reason I made the second cake was that when I was preparing the first I accidentally added yellow food coloring instead of red to the batter. Oops! After adding a lot of pink and purple (I was out of red) I finally had a batter which resembled red. The problem with making a tinted cake batter is that you never know how it will turn out until you cut into it. So I decided to use the first cake as practice and had my daughter help me make the candy cane design. The second cake design I used a more traditional approach for frosting a bundt, by pouring a glaze over the cake. 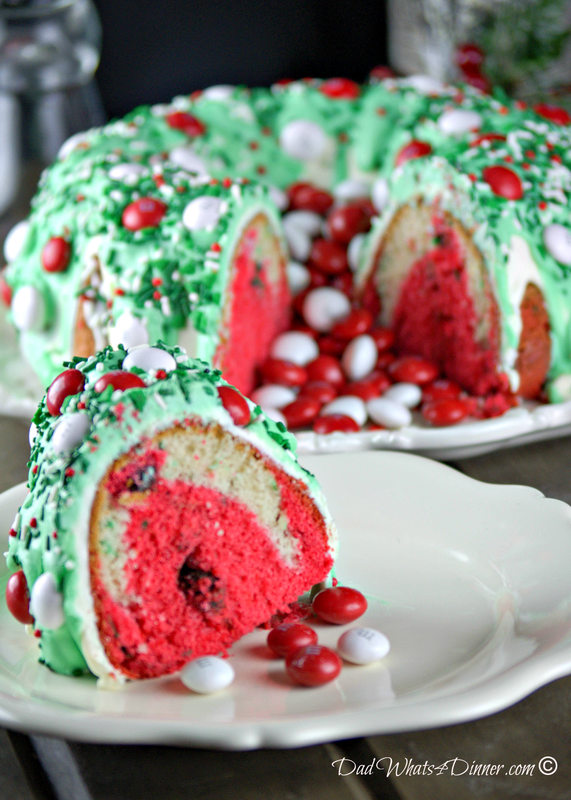 To make my Christmas M&M’s® Bundt Cake: Whisk eggs, milk, water and oil in a small bowl. Add wet ingredients to the cake mix and combine according to package directions. Place half of the batter into a prepared bundt pan and add some M&M’s® Holiday Milk Chocolate. Add red food coloring (NOT YELLOW) to remaining batter and mix to desired color. Pour over batter already in the bundt pan and sprinkle on some more M&M’s® Holiday Milk Chocolate. Bake for about 40 minutes. Cool completely. To decorate: place white frosting in the microwave for 30 seconds, stirring after every ten. Drizzle glaze over cooled cake. Do the same with the Pillsbury™ Funfetti® Holiday Vanilla Flavored Green Frosting. Sprinkle with Funfetti® sprinkles. Place M&M’s® White Peppermint in a random pattern and pour remaining M&M’s® White Peppermint into the center of the bundt. Enjoy with a big glass of milk. We had a great time decorating the tree and our home is ready for the holidays. With this done we now have plenty of time to enjoy the holidays. Since it is the giving season, and I made two cakes, I had plenty of cake to give away to family and friends. Lightly grease and flour a bundt pan; set aside. In a small bowl whisk together water, milk, oil, and eggs. Place cake mix in a mixing bowl. Pour in wet ingredients and mix on low speed for 30 seconds. Beat on medium for 2 minutes until combined. Pour half of the cake batter into prepared bundt pan. Sprinkle about a 1/3 cup milk chocolate M&M's® and push down slightly into batter. Add red food coloring to remaining batter and mix until desired color is reached. Pour red cake batter over white. Add another cup of Milk chocolate M&M's® and push into batter. Bake cake for 40-45 minutes until a toothpick inserted comes out clean. Cool for 5 minutes then invert cake onto cooling rack. Place white frosting in microwave for 30 seconds, stirring after every ten sec. Drizzle glaze over cooled cake. Do the same with the Pillsbury™ Funfetti® Holiday Vanilla Flavored Green Frosting. Place M&M's® White Peppermint in a random pattern. 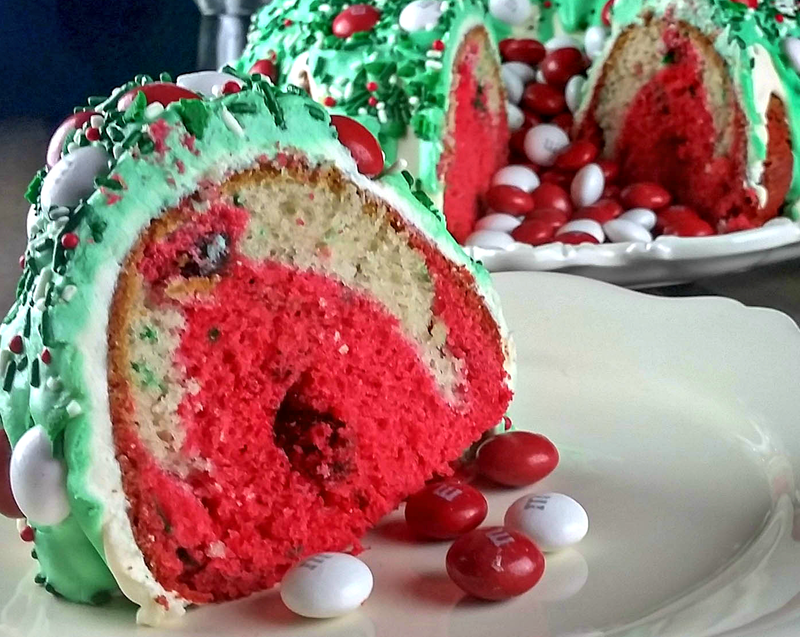 Pour remaining M&M's® White Peppermint into the center of the bundt. Enjoy with a big glass of milk. 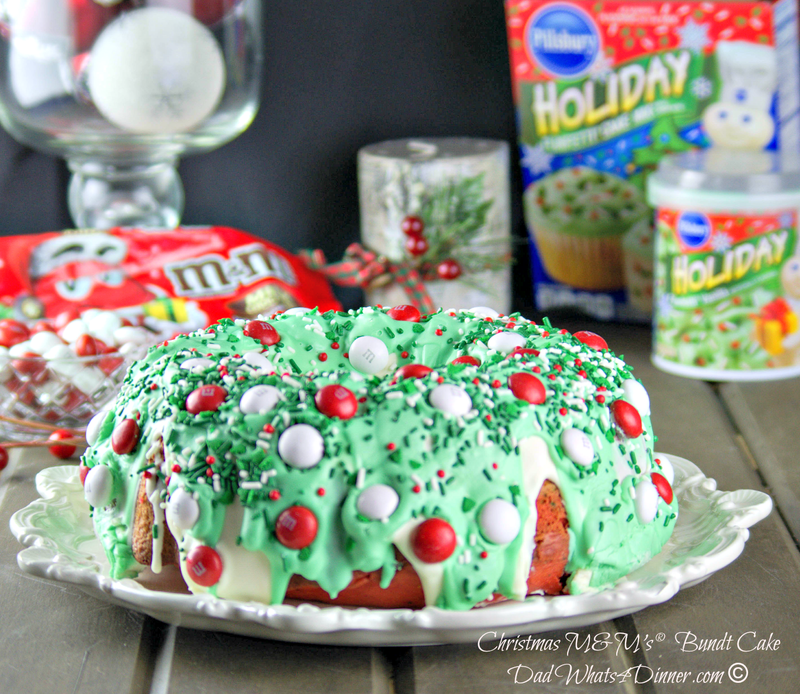 I will be bringing my Christmas M&M’s Bundt Cake recipe to Freedom Fridays, Friday Favorites, Fiesta Friday, Weekend Potluck, What’s Cooking Wednesdays. Checkout my Link Parties page for other great places to find new recipes. Click to Pin It for later: Be sure to check out more delicious holiday baking recipes. 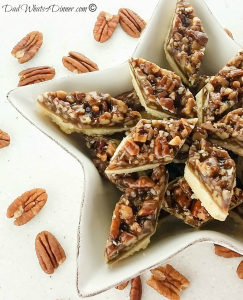 I’d love to hear about your favorite holiday recipe and family traditions! Yum Quinn this looks delicious. Its about time I made a bundt cake. I love your family tradition! I especially am excited about your cute bundt cake. I am going to have to make this for our tree trimming. It was cute and easy. Very festive. Thanks for stopping by and enjoy your tree trimming. Thanks for stopping by. Sorry I am just getting back to you the message was kicked into the spam folder. Glad to share. You have captured the colors of the season in this cake! Thanks for bringing this to FF. Our family has the same ornament tradition, we now have enough to decorate several trees! It’s fun to bring them out and share memories of when and where they were purchased. Each one has a back story. i cannot see the recipe. what am i doing wrong? facebook. i just updated computer to microsoft 10. Thanks Janet. Were you able to click on any of my recipes or nothing showing at all on my site? 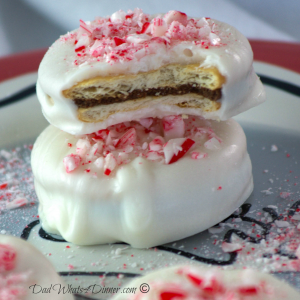 i was able to get the peppermint ritz kisses with no problem. 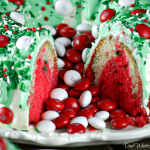 can you email a copy of the christmass m&m bundt cake? Hi Janet. I was going to send you a message today. Julie from Hostess at Heart also had the same problem and she figured out yesterday that is was her Ad block setting blocking the pages that contained Ads.Give that a try but I can also send you a copy of the recipe. 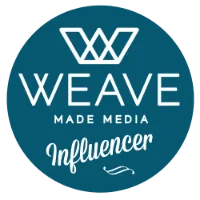 Thanks for returning to the blog. Sorry for the problems. Thank you for bringing your very festive cake to FF to start off the season Quinn! Thanks Johanne. Baked all day yesterday. Happy FF! Looks like a perfect Cake for a Christmas Party! Thank you for sharing with us at Snickerdoodle Sunday. Pinning and tweeting to share. Thanks Laurie. Have a great week. I am loving this colourful Christmas cake! And who doesn’t love M&M’s? 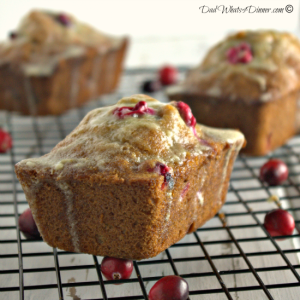 Your recipe received the most clicks last week, over at Simple Supper Tuesday. We’d love for you to join us again this week! Thanks.. It is always a little scary when you do that because you never know how it will turn out until you cut into the cake. Thanks for stopping by. Quinn, this looks absolutely delicious! Definitely going to have to make this. Thanks for sharing at Merry Monday, hope to see you again next week! Thanks. Let me know how it turns out. See you again next week. 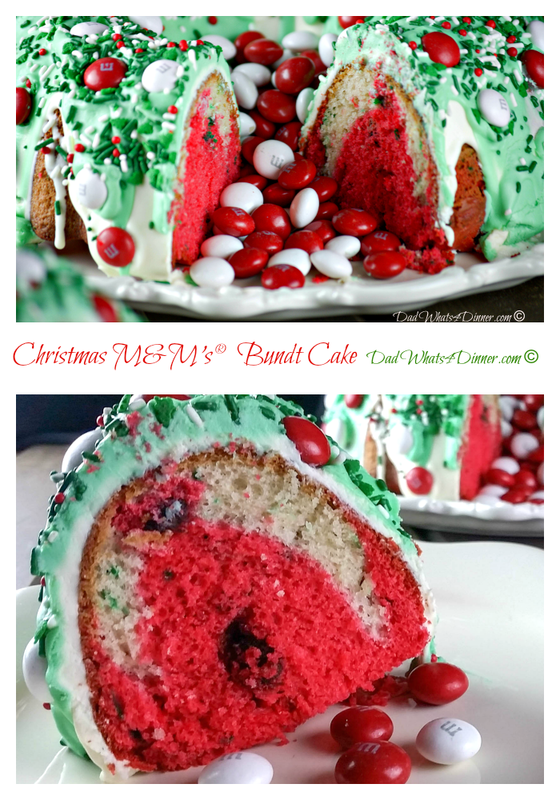 This is such a nice, colorful Christmas bundt cake, both designs are awesome. Thanks for sharing with Fiesta Friday. Hi Sashna. Thanks for stopping by. Sorry I am just getting back to you. You were picked up by my spam filter for some reason. Happy FF! Thanks Arlene. It has been a nice family tradition we enjoy every year. Maybe someday we will do it with the grand kids. hopefully many years down the road. If I made this for tree-trimming time I don’t think much tree trimming would actually get done! So festive and delicious. And those sleigh pix will be so fun to look at as the years pass. Thanks for sharing at #SaucySaturdays.